Heat the oven to 180C. Bake the potatoes until tender, about 45 minutes. Cool and cut each potato into 4 wedges. Scoop out most of the cooked potato (keep and use for mash or fishcakes - you can freeze it), leaving a shell of potato and skin about 8mm thick. Spritz with oil on both sides and season. Put on a baking tray, set on top of an oven tray. Bake for 30 minutes or until crisp and golden. To make the dip mix together the soured cream and chives. 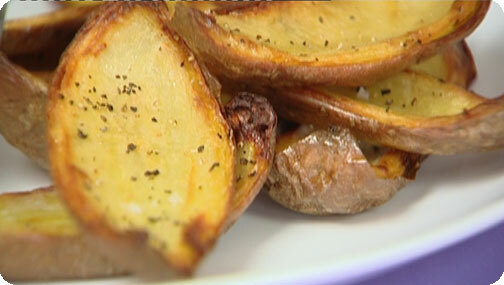 Serve the potato wedges with this dip.